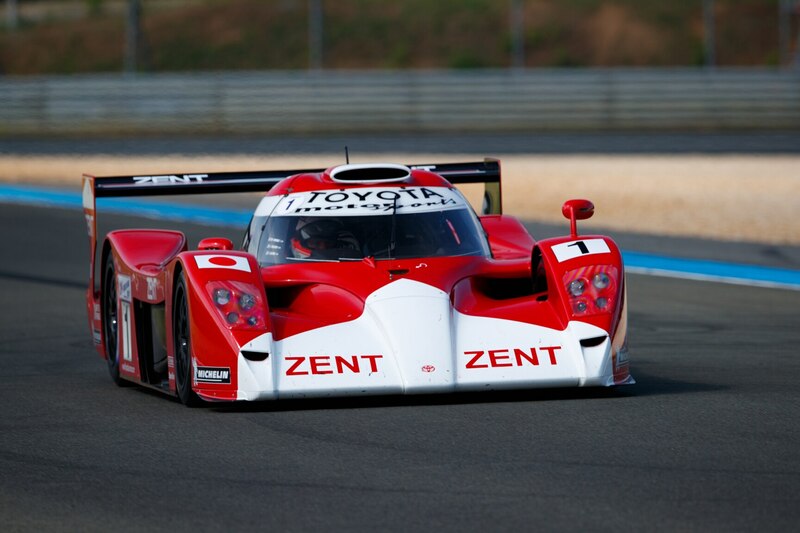 This year Toyota finally scored the company’s first outright victory in the 24 Hours of Le Mans. The Japanese manufacturer came achingly close at many occasions, usually missing out because of bad luck. 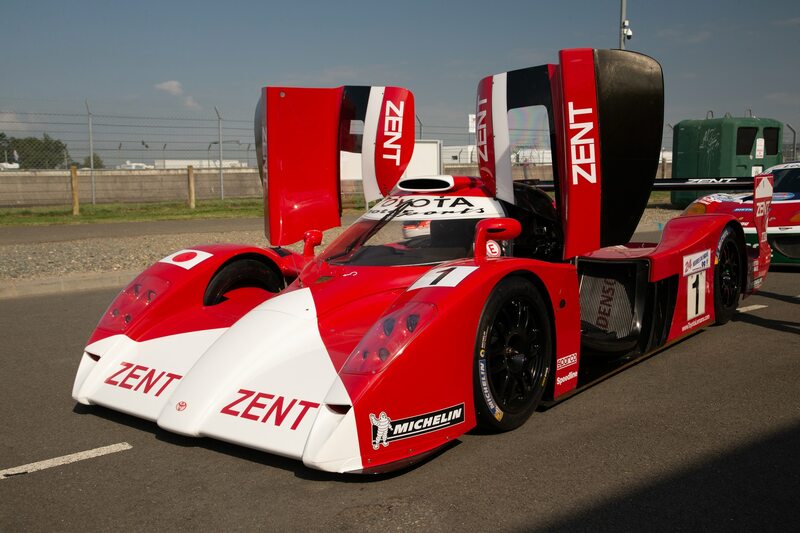 That was certainly the case in 1999 when Toyota fielded three examples of the fabulous GT-One. 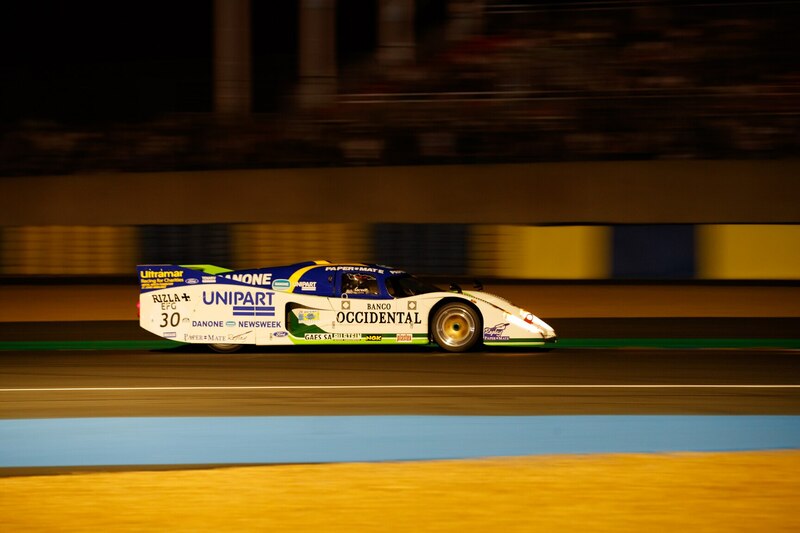 Powered by a twin-turbo V-8, it was the among the fastest cars during that race until several tire failures thwarted the charge. 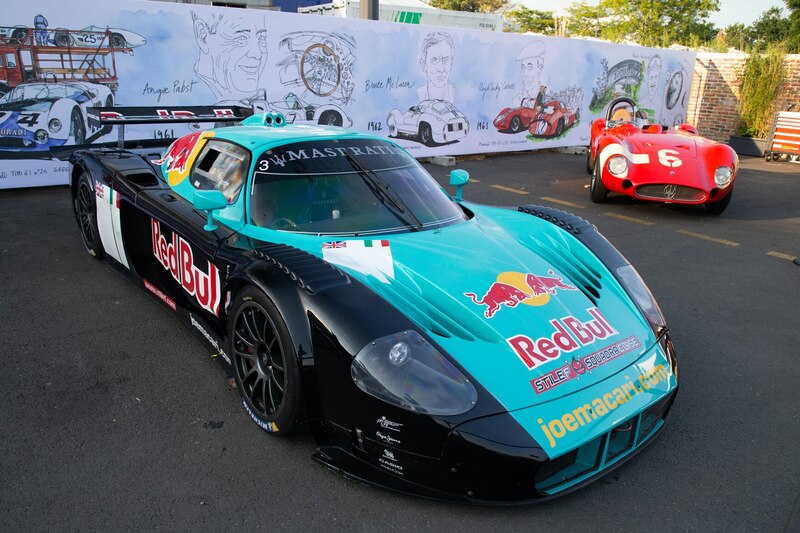 Gifted to designer Andre de Cortanze, this is the only example in private hands and was wheeled out for the Global Endurance Legends showcase by its recent new owner. In period, it had qualified on pole position only to crash out after a high-speed puncture at one of the fastest parts of the track. 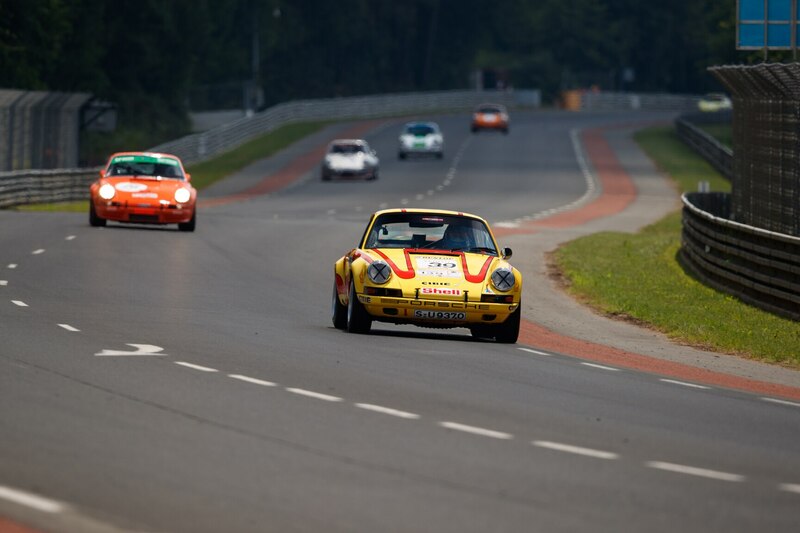 It’s hard to imagine a GT class in practically any race series these days that does not feature a Porsche 911. 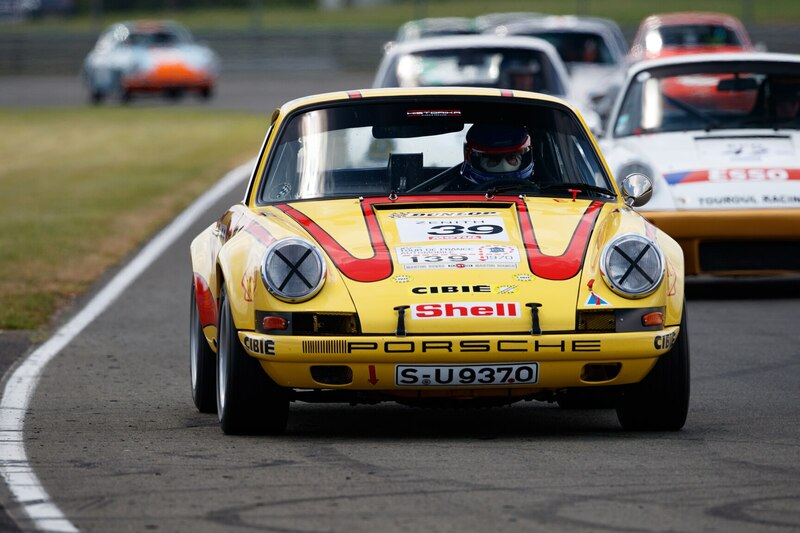 However, it would take several years after the road cars launched before the German manufacturer started producing factory competition versions of the 911. 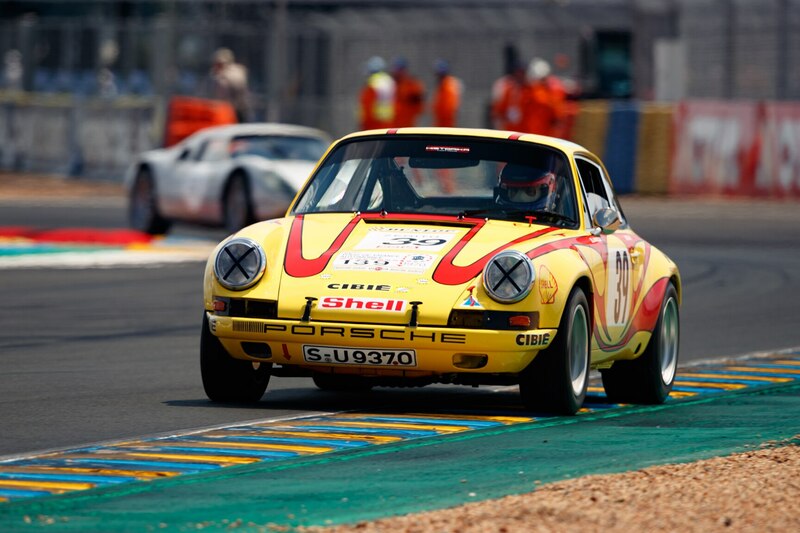 Among the earliest racers were the 911 ST models built in the early 1970s. With the ST undergoing continuous development, no two examples were quite the same. 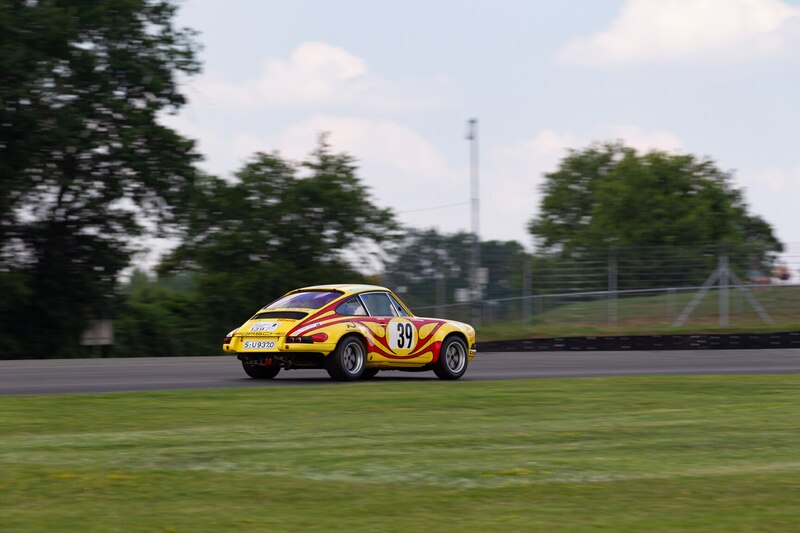 The car that was raced this year in the Porsche Classic race was built specifically for the 1970 Tour de France with Gérard Larrousse at the wheel. Porsche initially intended to race a sports prototype, but after inspecting the roads some time prior to the event decided a road-car-based racer would be more suitable. 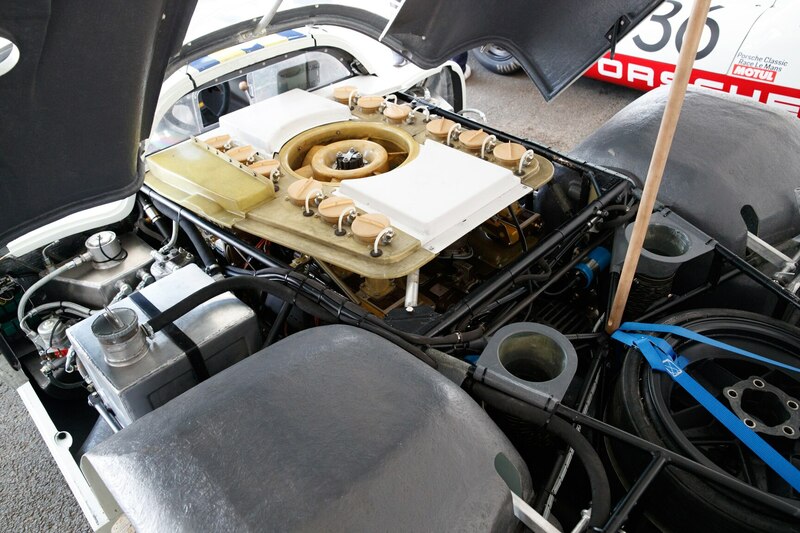 Stripped down to its bare bones, it weighed less than 1800 pounds, making it the lightest 911 racing car ever. 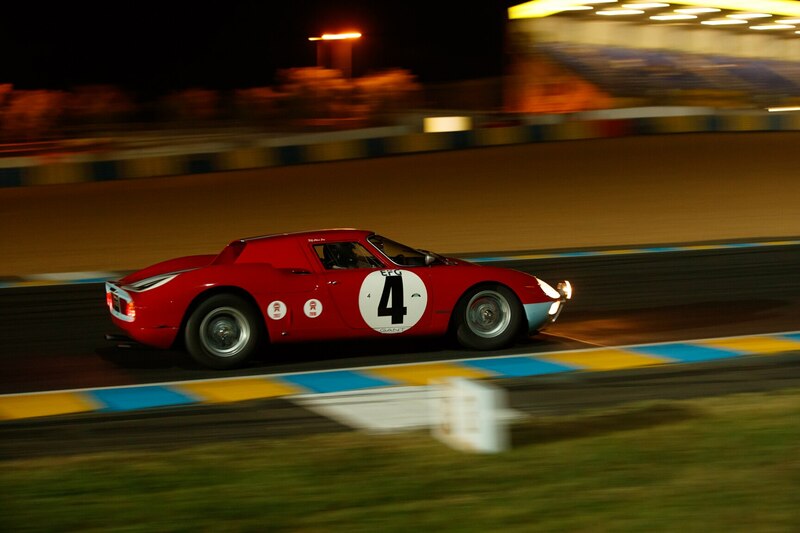 When Porsche showed up for the actual race, the German company was mortified to find that the entire route had just been resurfaced, which conveniently provided the advantage to the French Matra prototypes, which duly finished first and second. Larrousse finished third, probably much closer to the Matras than a road car should have been. 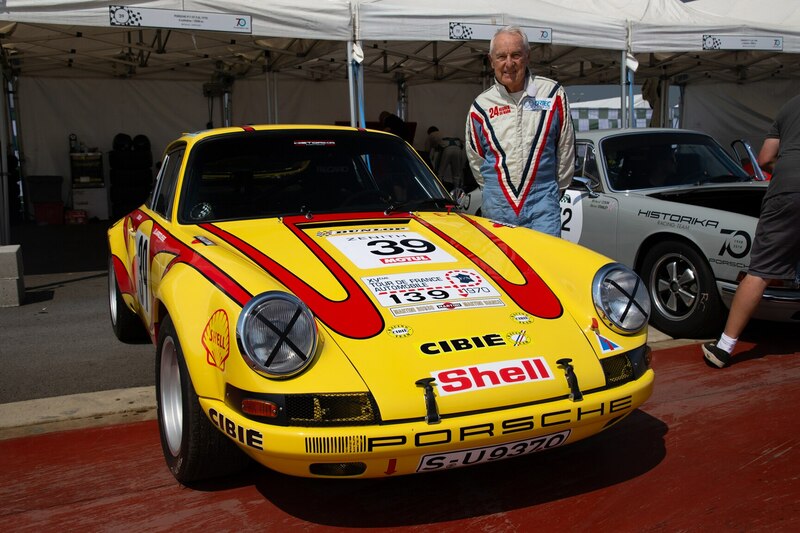 Fittingly, the French ace was reunited with his old ST for the Porsche race. 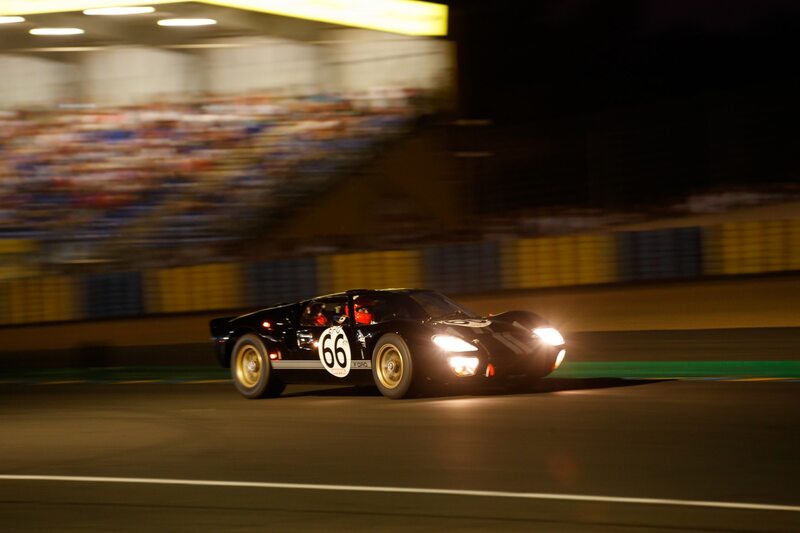 One of the most important cars that took part in the main event this year was the actual Ford GT40 MkII that won the 1966 24 Hours of Le Mans outright, scoring the first overall victory for the Blue Oval. 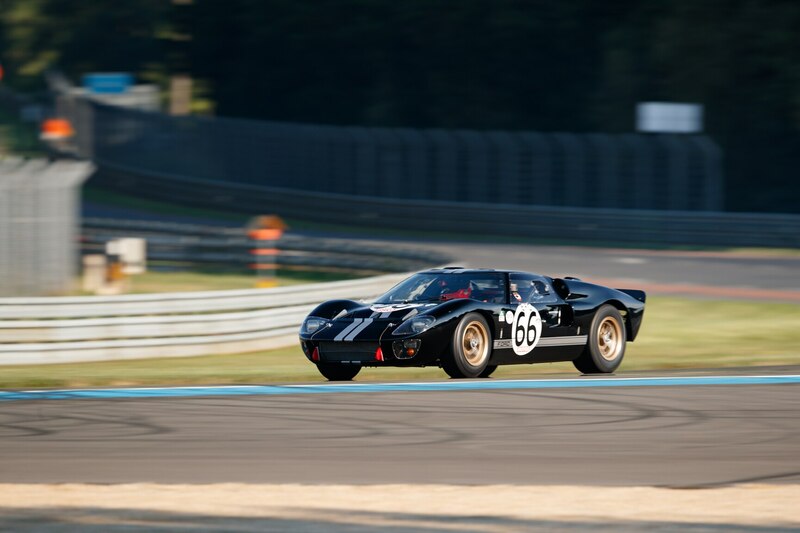 After disappointing results in 1964 and 1965, Ford supported no fewer than eight GT40s in 1966, which were entered by several teams. This car was built to big-block MkII specifications and was entered by Holman & Moody for ‘Kiwis’ Bruce McLaren and Chris Amon. 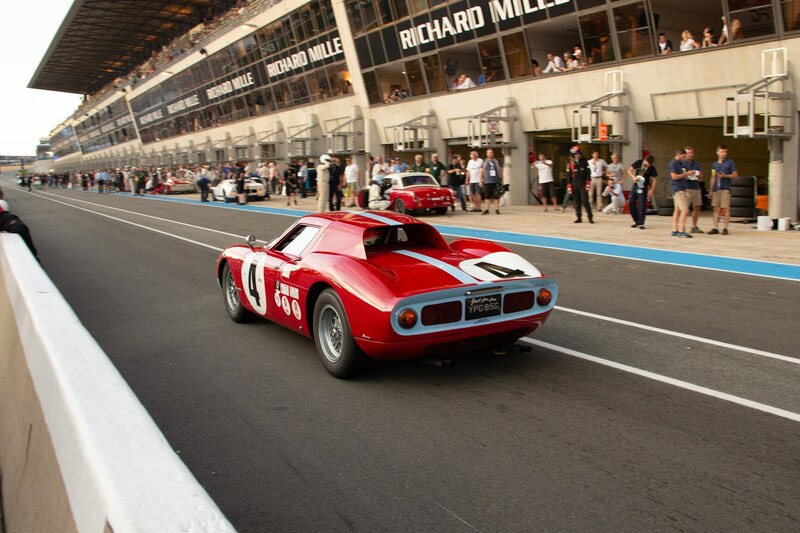 Ford finally managed to beat Ferrari in 1966 with its one-two-three victory. To drive the point home, the cars were brought together as they crossed the finish line for a picture-perfect ending, just as Ferrari did a few months earlier at Daytona. 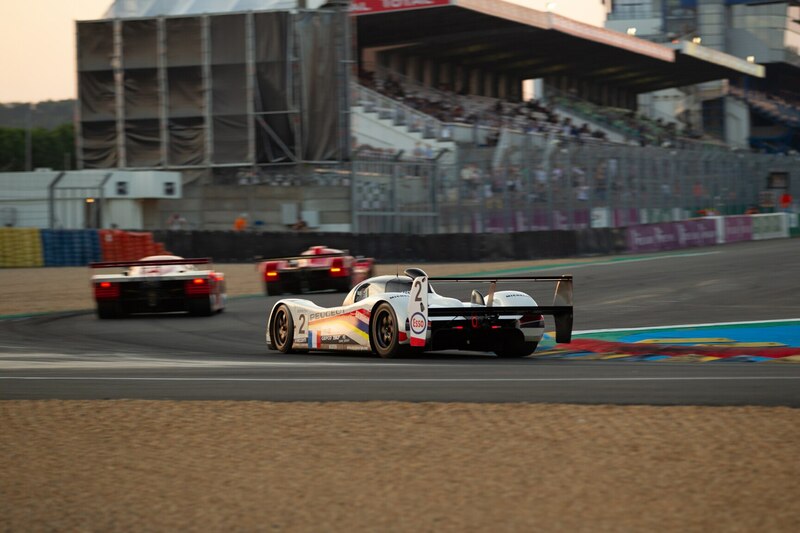 As a twist, the car that crossed the line in second was ultimately declared the winner as it had started further down the order and thus had covered the most distance. 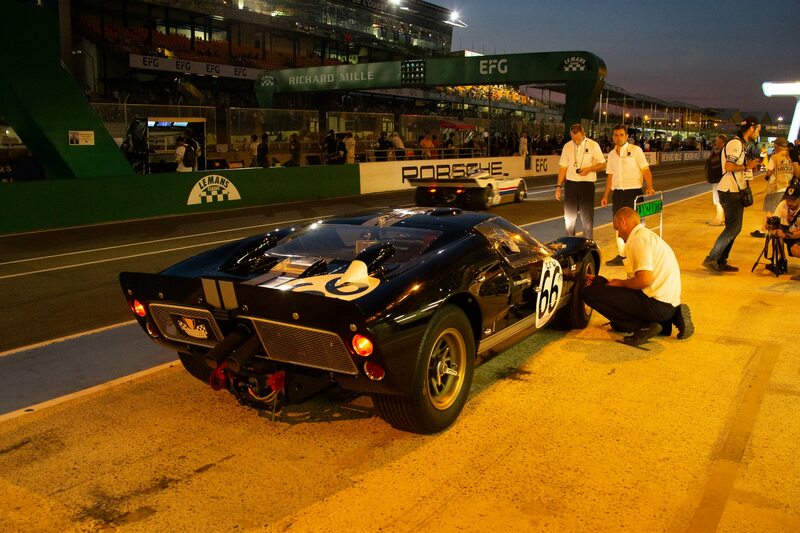 There was additional confusion later over which car was the winner, as Ford painted several MkIIs in the Le Mans winner for publicity reasons. As a result, this example—the actual winning car, by the way—was sold off and spent many years hidden away in a Belgian shed. 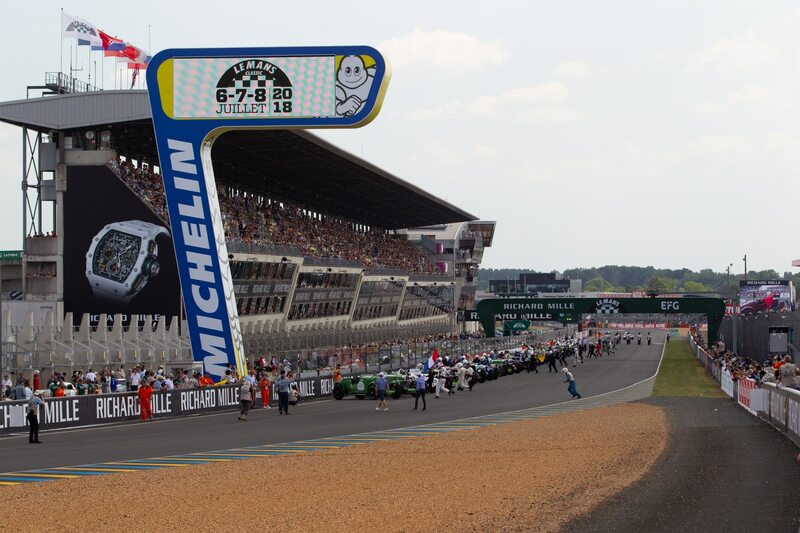 It was eventually discovered and is today in the caring hands of American vintage racer and NASCAR team owner Rob Kauffman, who was brave enough to race the priceless machine at Le Mans once more. 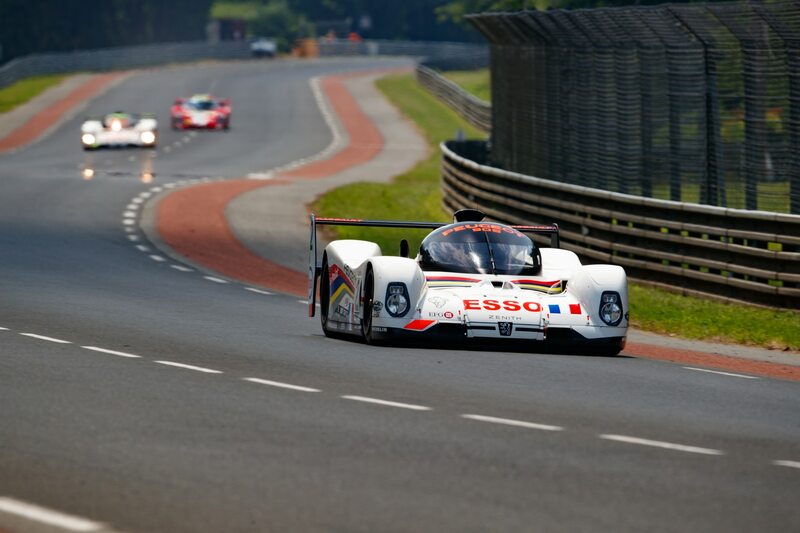 Group C cars have achieved a mythical stature for many sports-car-racing enthusiasts. 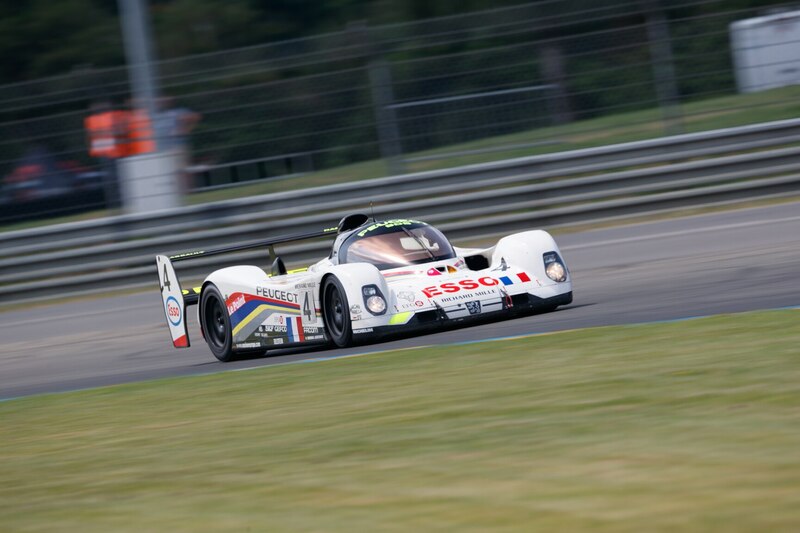 Raced between 1982 and 1993, the original breed of Group C cars had relatively few restrictions, with a limited fuel supply providing the balance between the different cars. 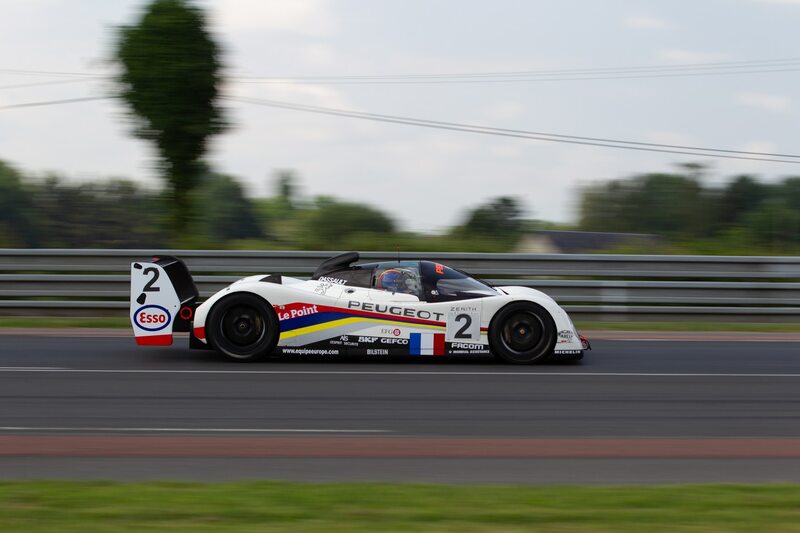 A second generation of Group C cars was introduced in the early 1990s with 3.5-liter engine regulations that were similar to those for Formula 1. 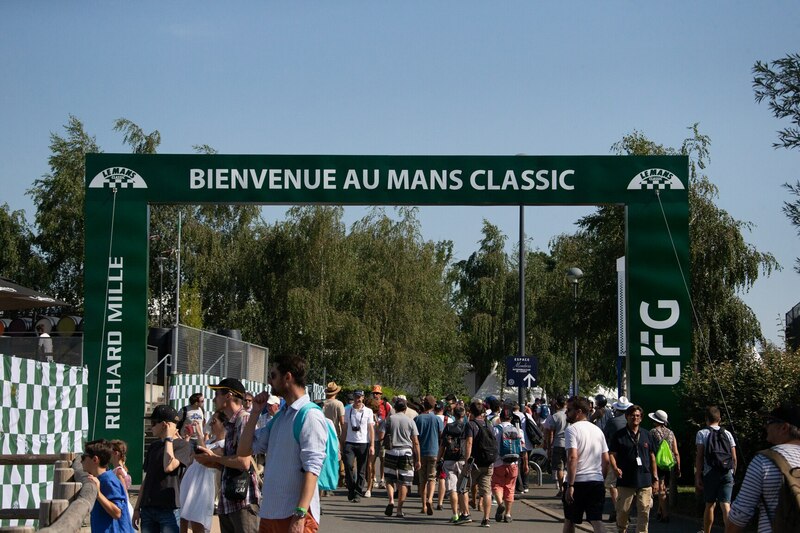 Most historians make the point that this was a cynical plan on the part of the governing body to lure the many manufacturers active in Group C back to Formula 1. 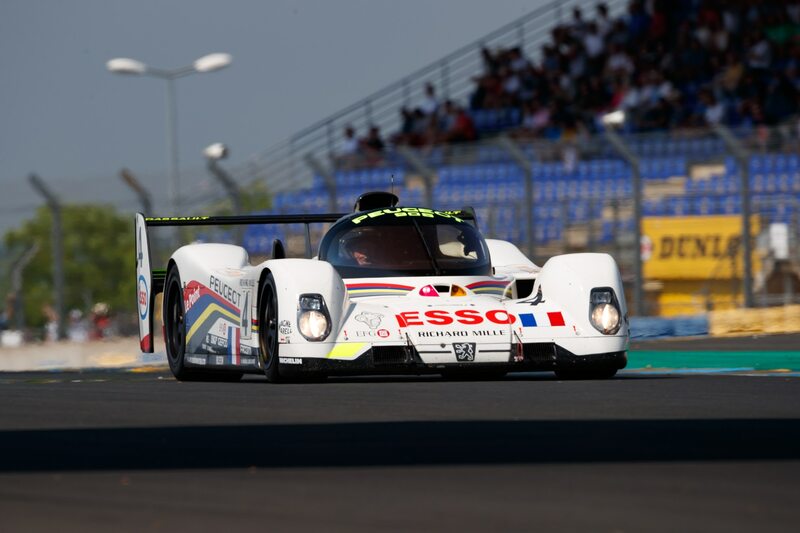 That was certainly the case with Peugeot but before it moved on, the team scored two Le Mans wins with the glorious V-10–engined 905s. 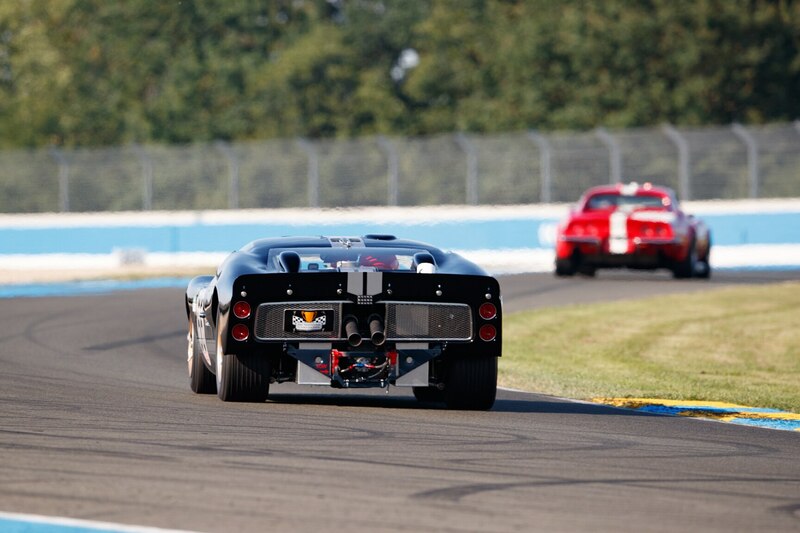 Hugely complicated to run and incredibly fast, they are a very rare sight. 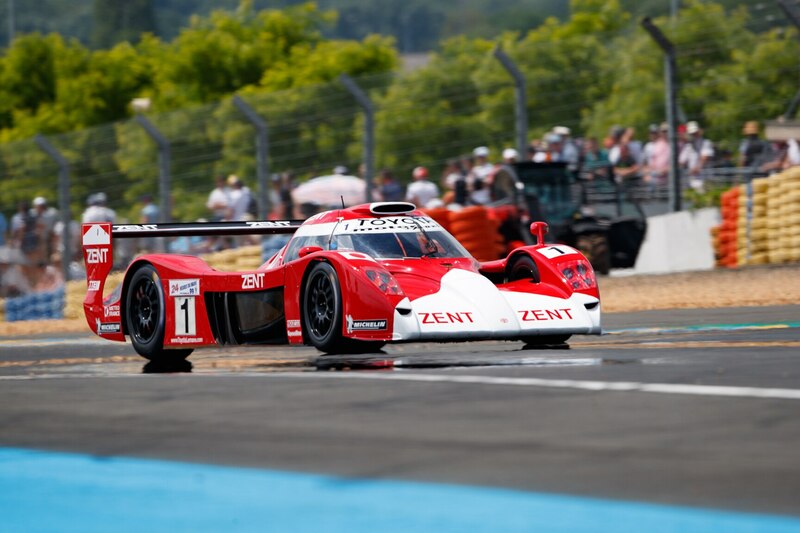 Yet this year’s Group C race featured not one, but two of the machines, marking in all likelihood the first time a pair have raced together since Le Mans in 1993. 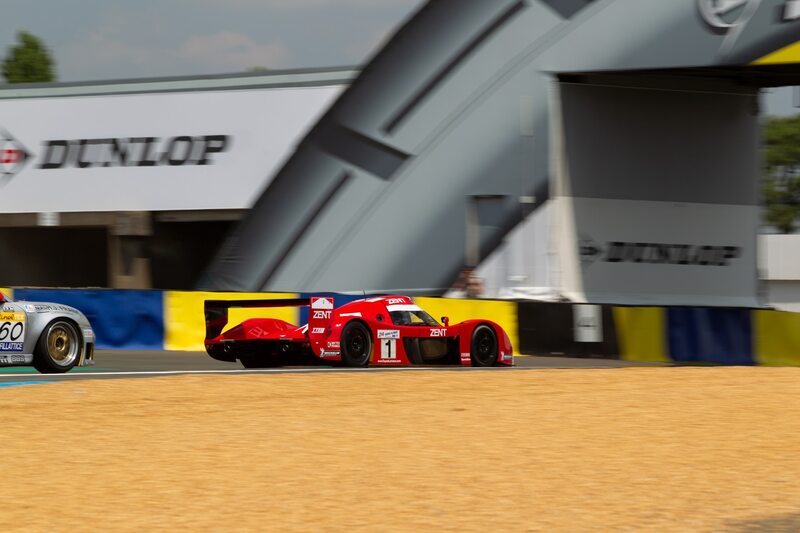 Run by French specialists Equipe Europe, the cars now benefit from more modern engine management that allow the V10s to run a little better and longer. This was developed—probably at no small cost—by Oreca. Peugeot’s subsequent spell as an engine supplier in Formula 1 was an utter disaster, with the V-10 universally hated by the teams that ran it. 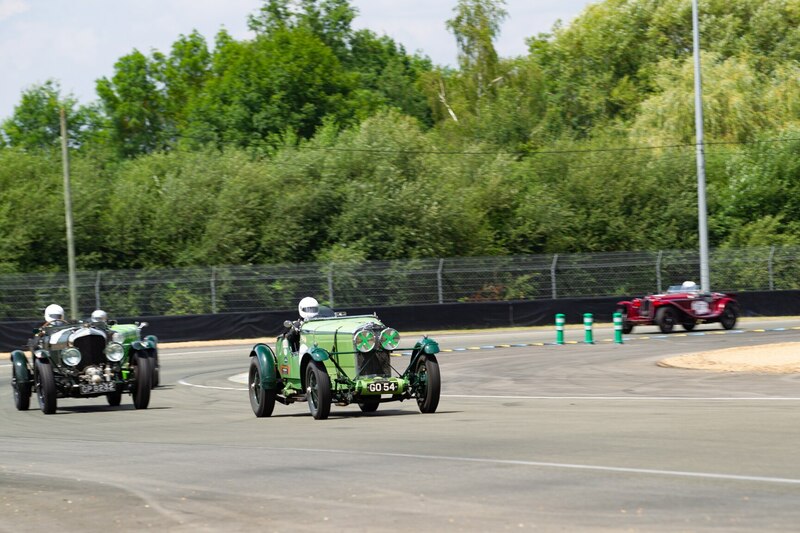 Before World War II, the 24 Hours of Le Mans was dominated for lengthy periods by single makes, including Bentley in the late 1920s and then Alfa Romeo in the first half of the 1930s. 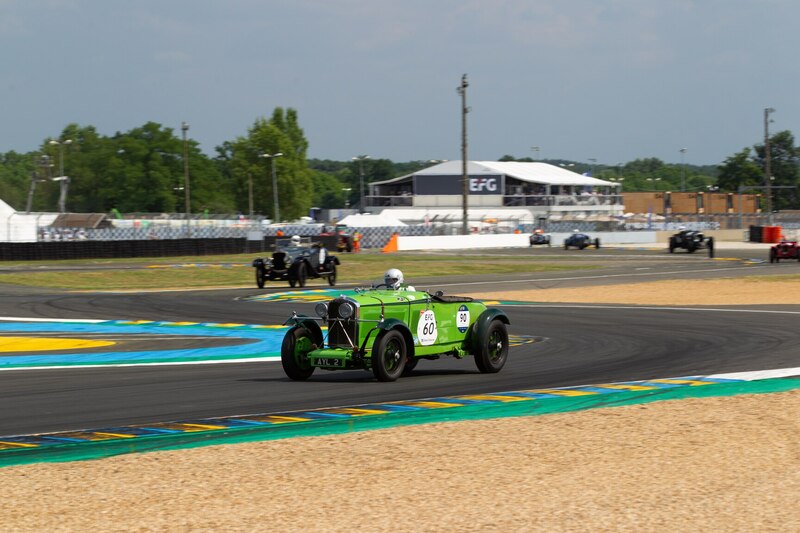 Not among them was the British marque Talbot, but the 105 racers built between 1931 and 1934 are today among the fastest prewar cars to compete in vintage racing. In period these six-cylinder cars were bodied, prepared, and fielded by Fox & Nicholl. 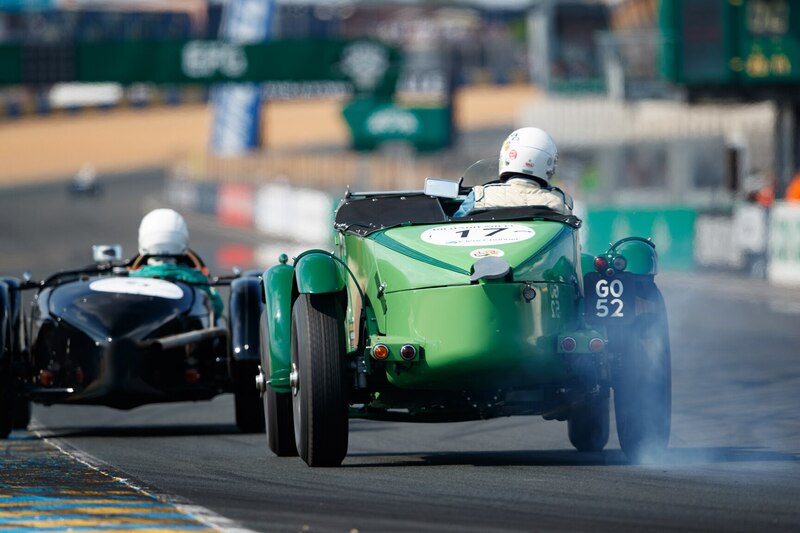 The ‘Team Cars’ were liveried in a striking green color and were commonly referred to by their registration numbers. 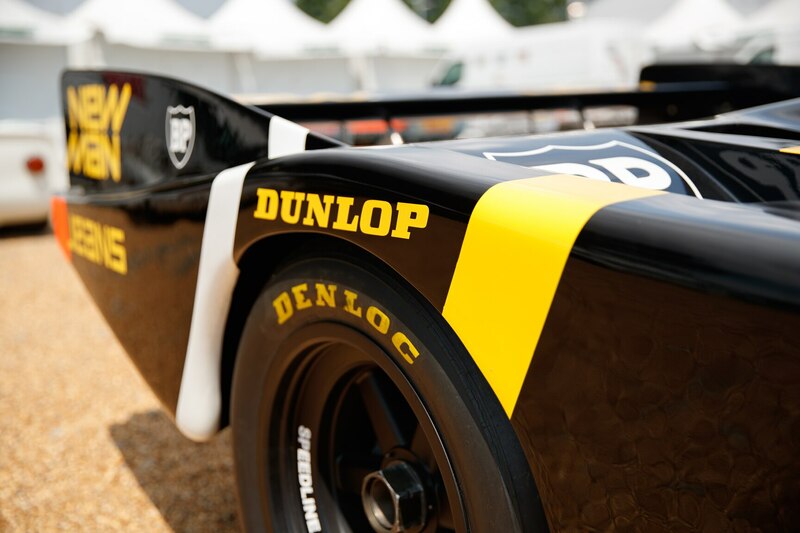 Although they could do no better than third at Le Mans, they were hugely successful elsewhere, including at Brooklands and in the Alpine Trial road rally. 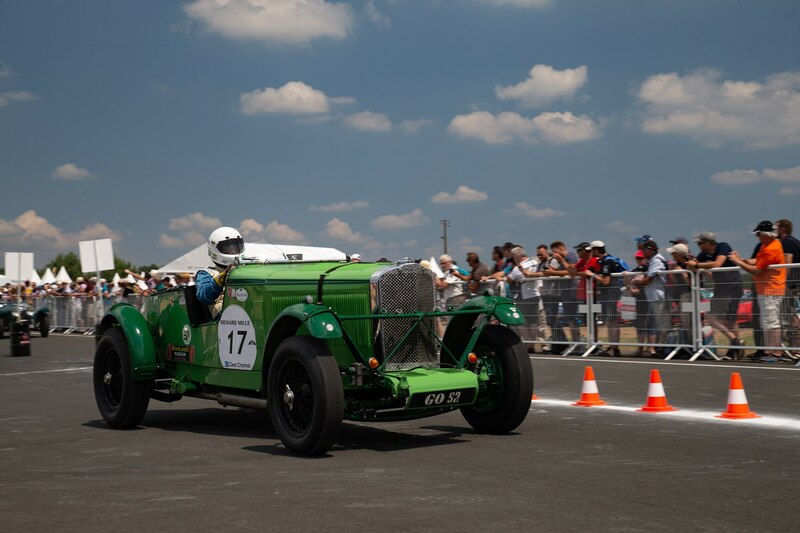 Today these cars are raced with great verve by a group of mostly British enthusiasts and the first class—or plateau—that covers cars from 1923 to 1929 was won by one of the Talbots. The other amusingly often lit up the inside rear tire on acceleration. 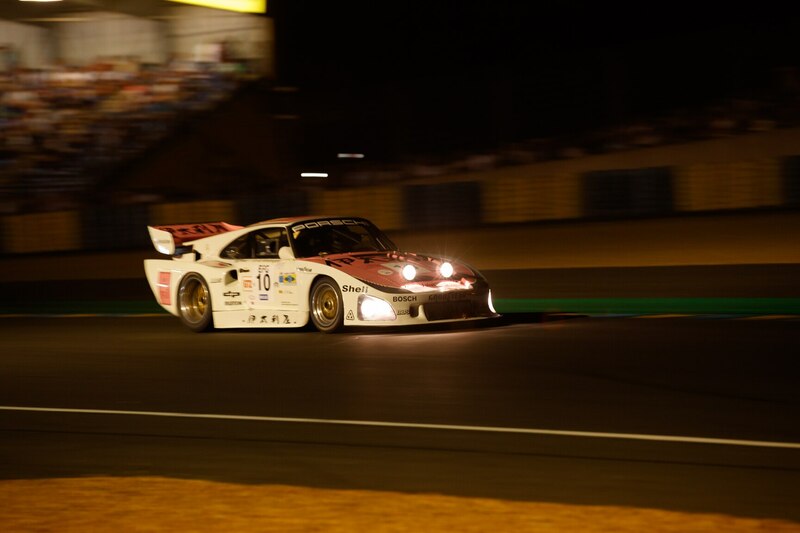 Well over a dozen examples of the Porsche 956 and 962 were at Le Mans during the Classic weekend but the one that is perhaps the most inconspicuous was the most interesting. 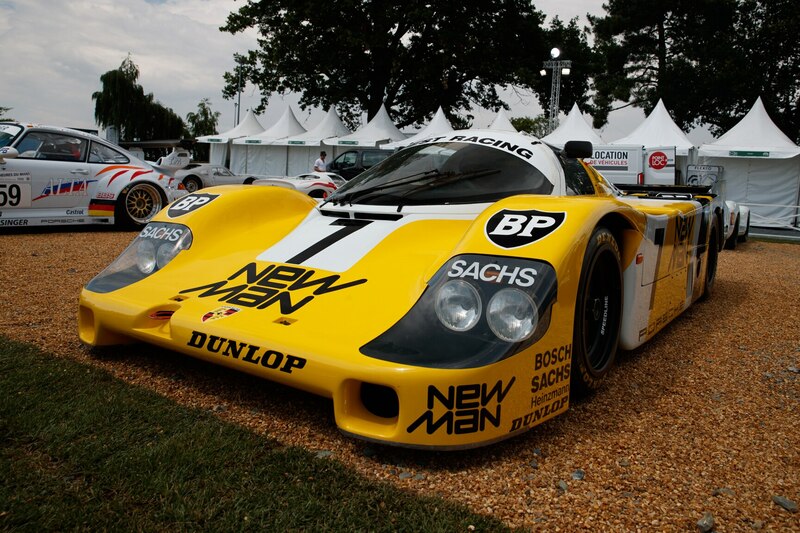 This was the ex-Team Joest Porsche 956B that was displayed in a special section dedicated to competition Porsches. 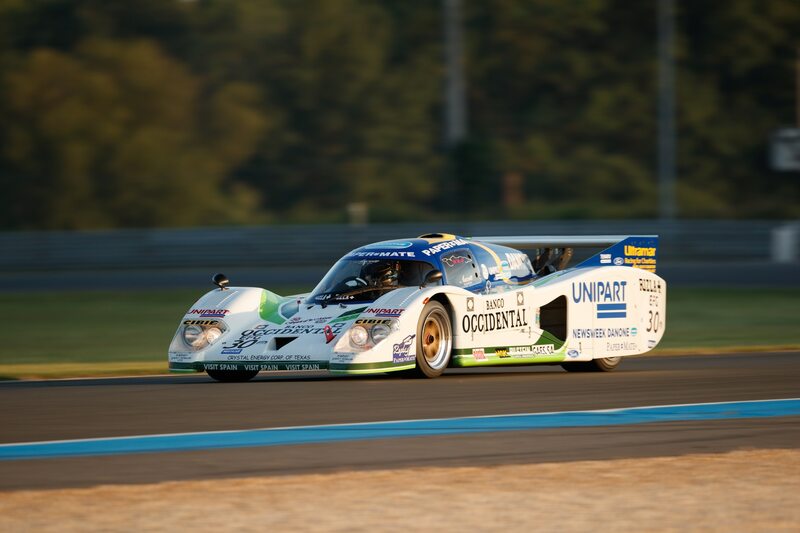 Built as one of the final customer cars, it was raced extensively by Team Joest and in fact may be the single most successful Group C car of all. 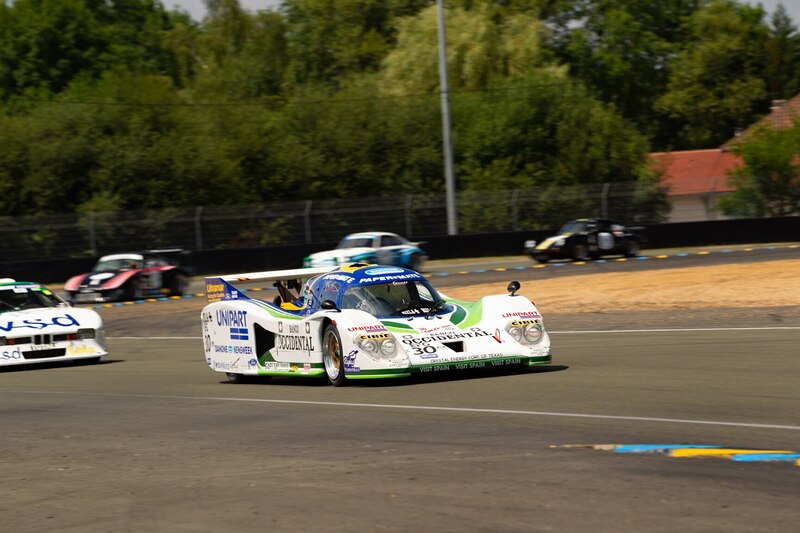 It won at Le Mans in 1984 with Klaus Ludwig and Henri Pescarolo at the wheel when the works team decided to skip the race. If that wasn’t impressive enough, it won again the following year with Ludwig joined this time by Paolo Barilla and Louis Krages, a.k.a. 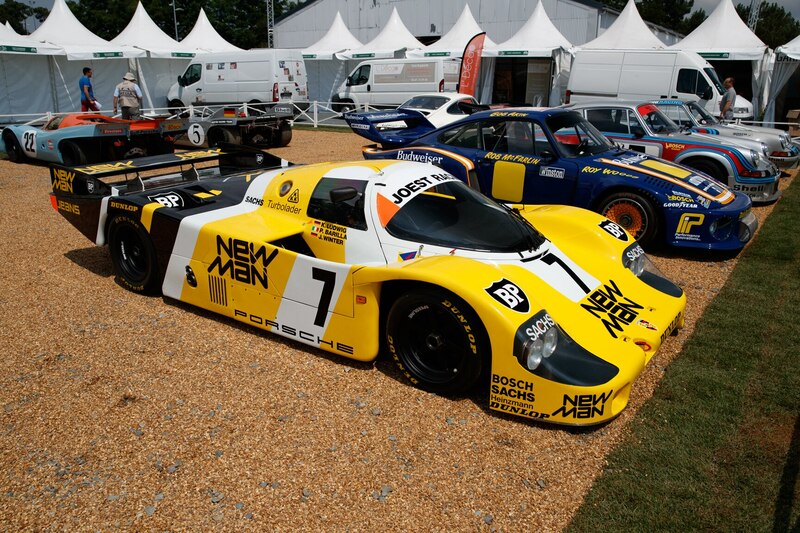 “John Winter.” This time, crucially, the works team was out in force with three examples of the brand new 962C. 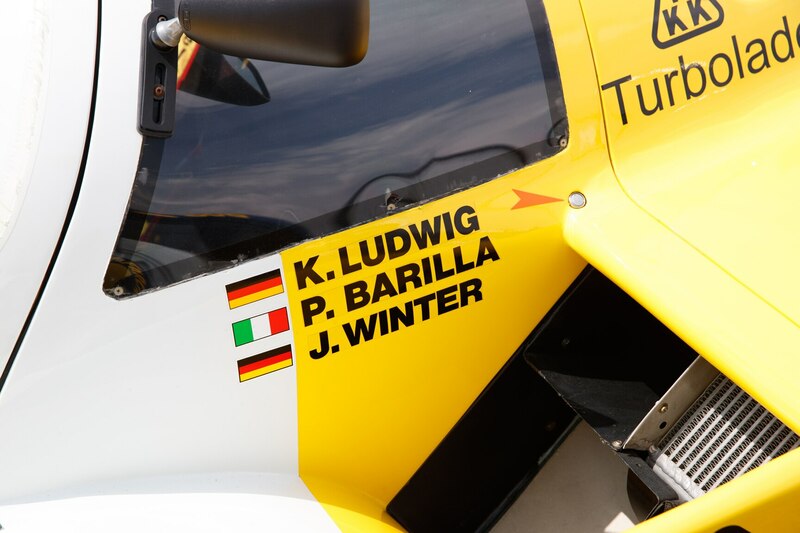 This would not be the last time that Joest would best the factory team with a customer car, but Reinhold Joest cherished this example—the only Group C car to win Le Mans twice—and displayed it for many years in his private museum. He only sold the car last year to the current British custodian, who has a formidable selection of sports racing cars. 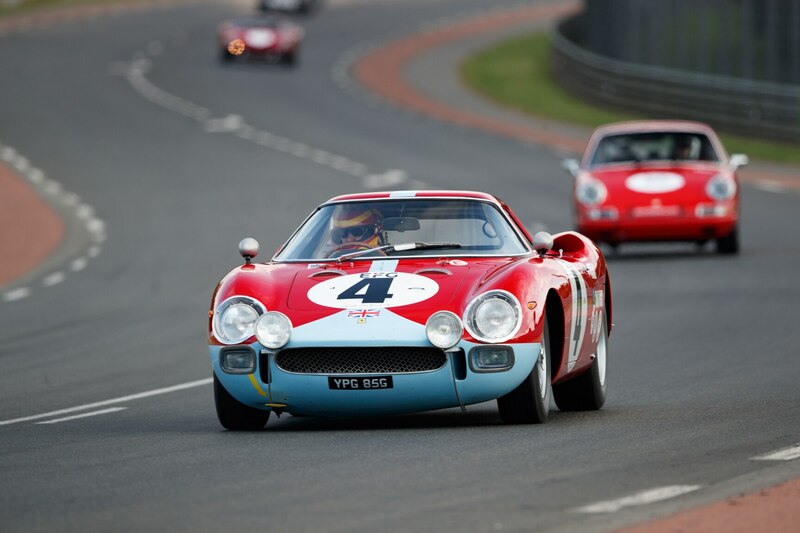 With values going through the roof these days, it is increasingly rare to see a “run-of-the-mill” Ferrari race in historic events. 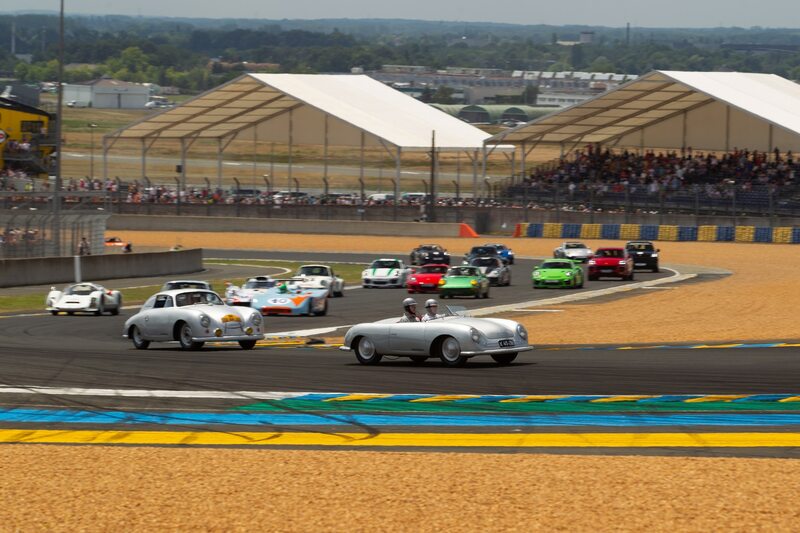 Rarer still is to see one of the fewer than three dozen 250 LMs being raced with great verve. 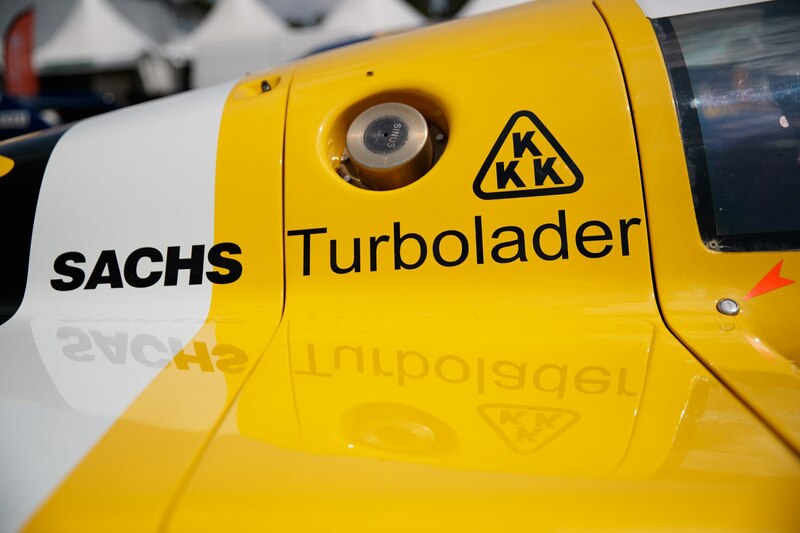 Fortunately, there is one enthusiast who campaigns his eight-figure machine and also entrusts it to professional racers. During the night session we even spotted glowing discs on the ex-Maranello Concessionaires example. 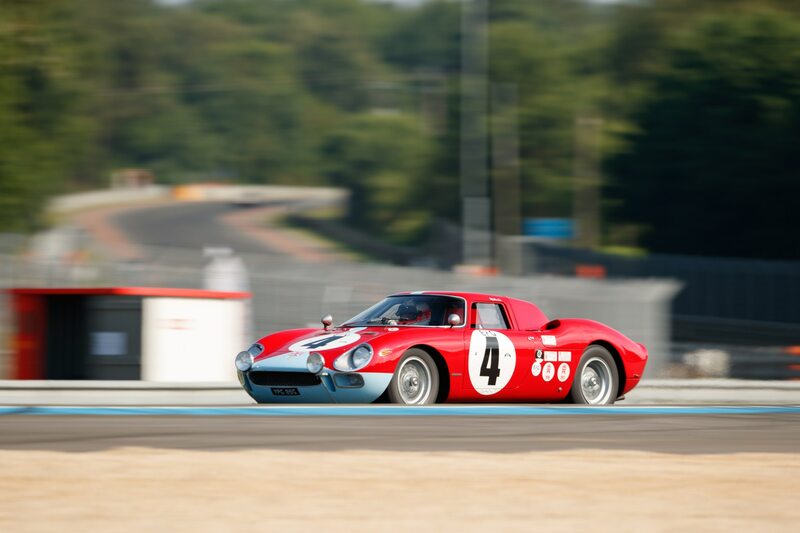 Finished in striking red and “Cambridge Blue” colors, this 250 LM was raced by the likes of Graham Hill, Jo Bonnier, and Denny Hulme in period. It was later part of some of the most formidable classic-car collections in the world. We’re lucky that it’s now in just the right pair of hands. It can be hard to remember that deep under the flared wheel arches and ultra-wide body panels of a Porsche 935, there is in fact a Porsche 911 hidden away—a 911 Turbo to be precise. 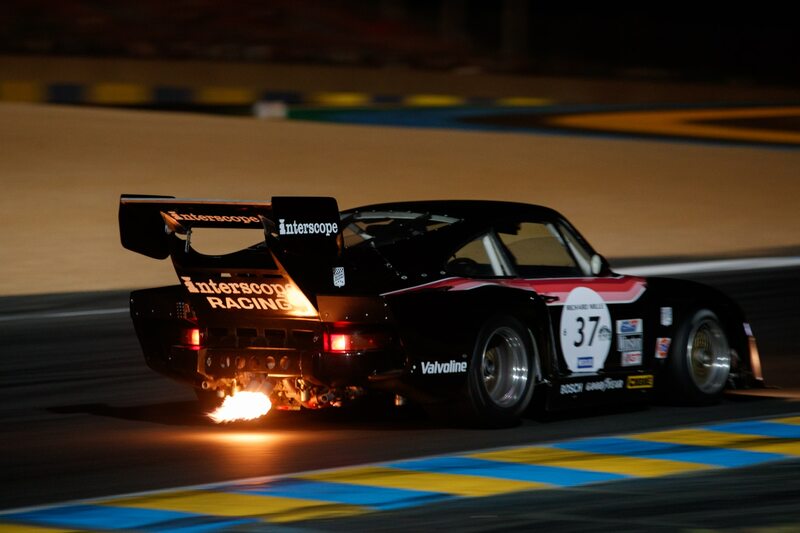 These silhouette racers dominated the GT class from the second half of the 1970s and even scored numerous outright wins, including at Le Mans in 1979. 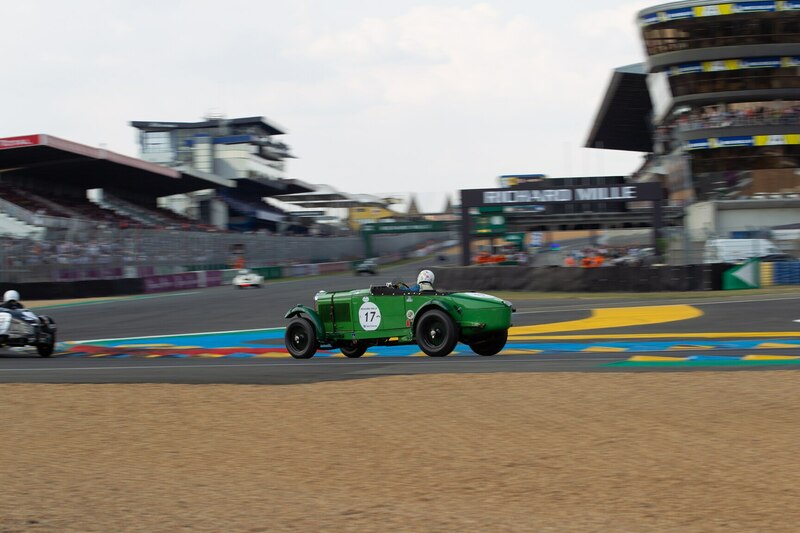 Many variants of these cars took to the track at Le Mans, including the wild ‘K3’ variant built by the Kremer Brothers. (It was this type that scored that ’79 victory.) 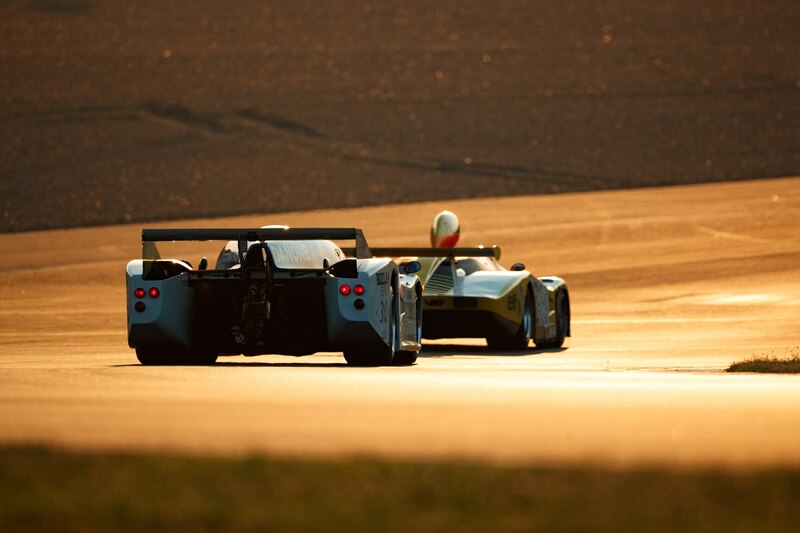 Also out on track was one of just two works cars that are in private hands. 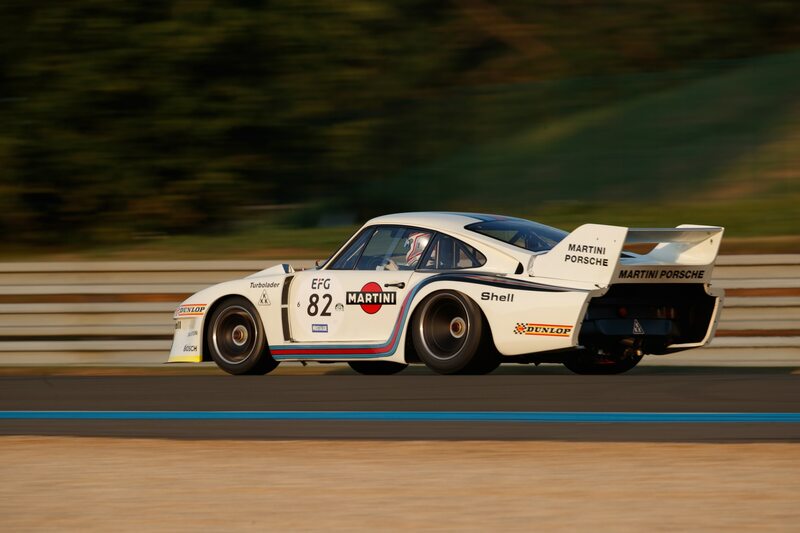 Restored by Porsche specialist Manfred Freisinger, this Martini-liveried car was driven by current works driver Romain Dumas, who had just two weeks earlier set a new outright record at the Pikes Peak hill climb. 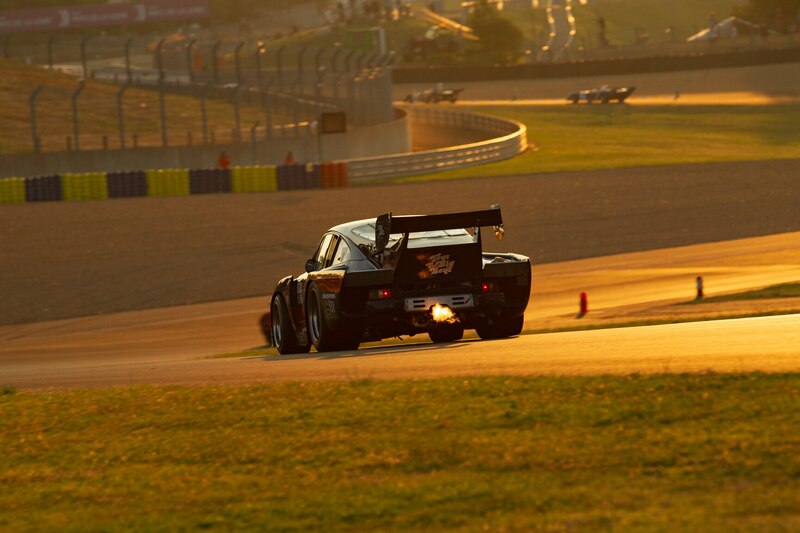 Usually belching out big flames on the overrun, the big yet deceivingly fast 935s were among the most spectacular cars in action during the weekend, and their legend is such that Porsche recently announced a limited series of new 935s based on the current GT2 RS. 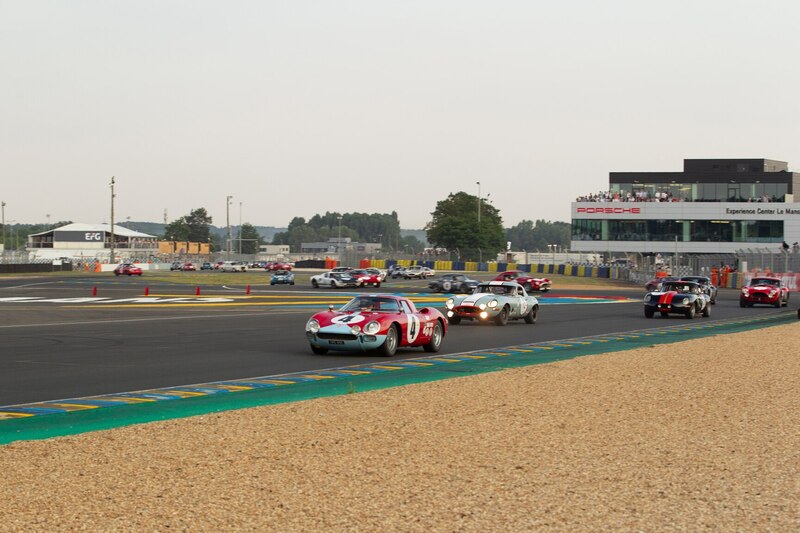 The cutoff year for the sixth and final plateau of classic 24 Hours cars is 1981, the year before the new Group C regulations came into effect. Desperately short on entries in what would be the final year for the current regulations, the organizers were a little more lenient in 1981. 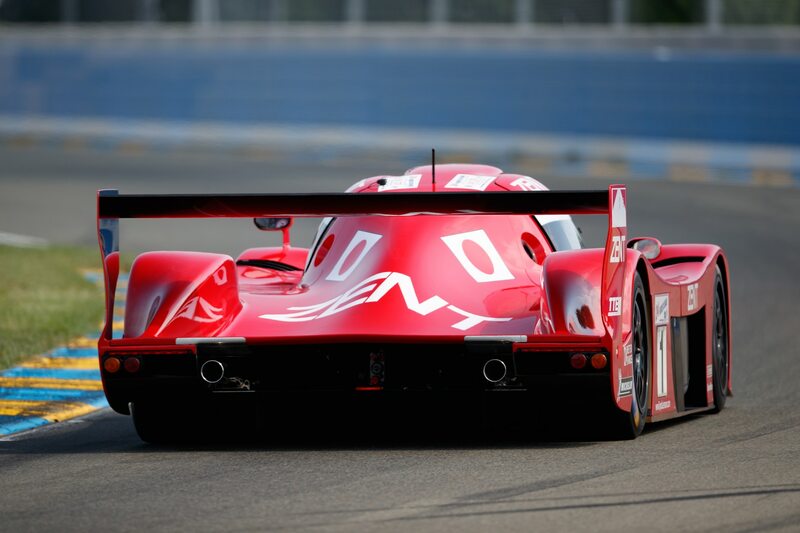 Among the cars allowed in was the brand-new Lola T600, which had been built to the new GTP regulations devised by IMSA in the United States but for all intents and purposes was a Group C car. 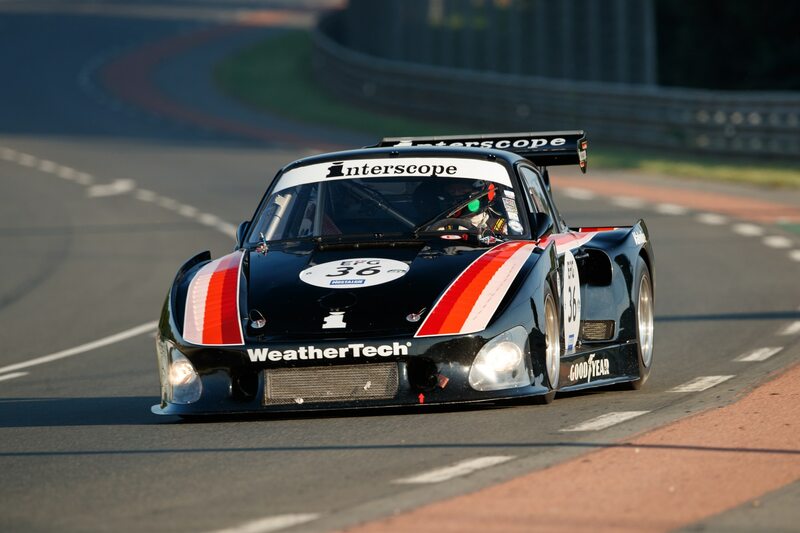 It boasted superior ground-effect aerodynamics and was allowed to run a slightly larger engine than the regular Group 6 prototypes. 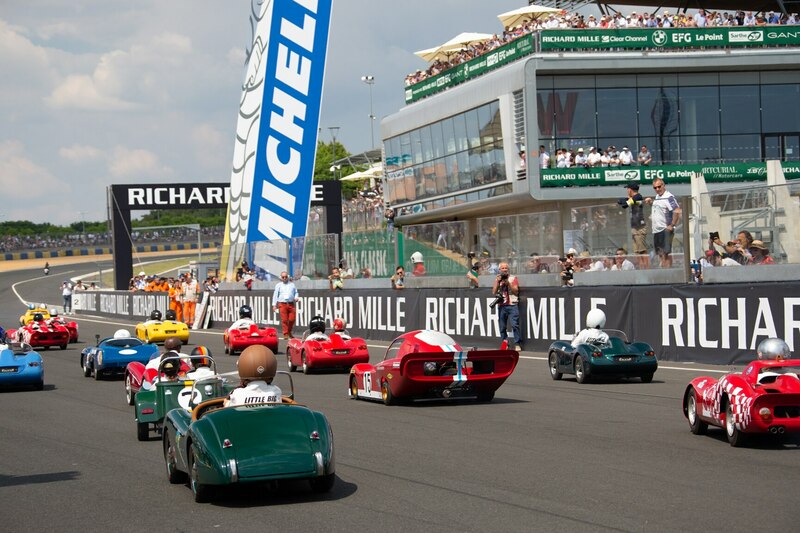 It really was surprising that it took until this year for one of these cars to make an appearance at Le Mans Classic. 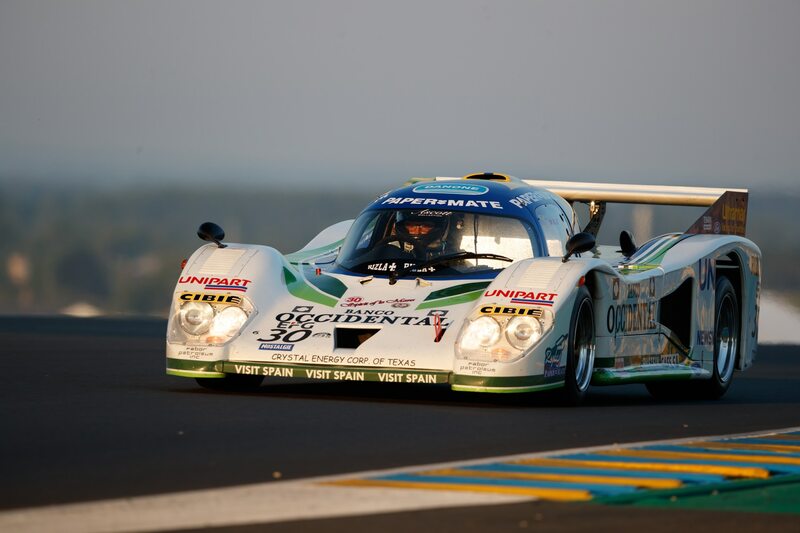 Raced at Le Mans in period, the Cosworth V-8–engined machine looks like a rocket ship on wheels. For a variety of reasons, this one could not quite vie for victory in its group but we understand a second one is currently being prepared, which should be even quicker still. 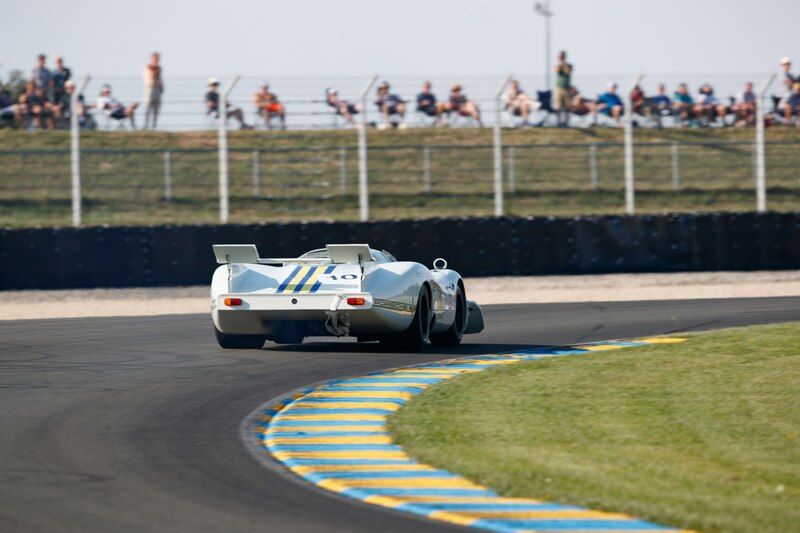 One of the most mythical of all Porsches, the 917 made history by scoring Porsche’s first two outright victories at Le Mans, in 1970 and 1971. 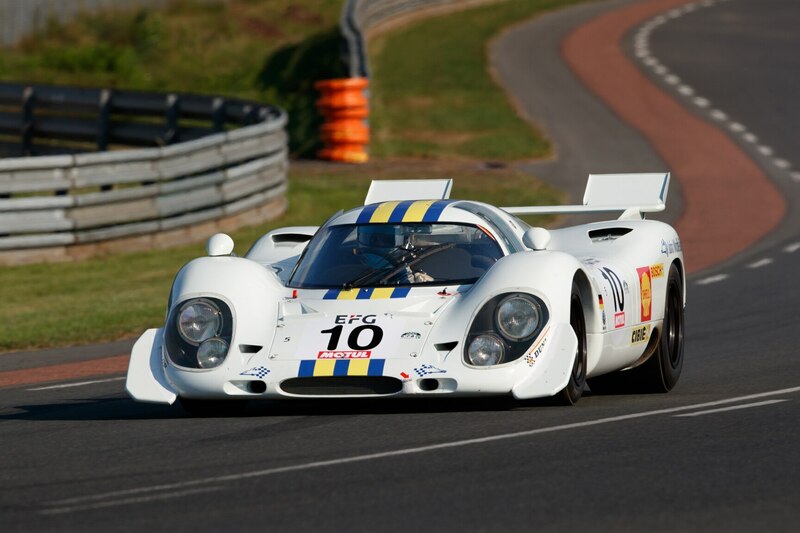 The winning cars, however, looked little like the original 917s of 1969, which had a very bad reputation. Porsche chief engineer Ferdinand Piëch cared only about top speed on the long straights and this made those earlier cars absolutely terrifying to drive, as the lift at high speeds caused them to wander from left to right and be virtually uncontrollable. Their reputation was such that most factory drivers refused to drive the cars, so one of the 917s entered in 1969 was actually driven by gentleman racer John Woolfe. Sadly, he was involved in a fiery crash on the opening lap that cost him his life. 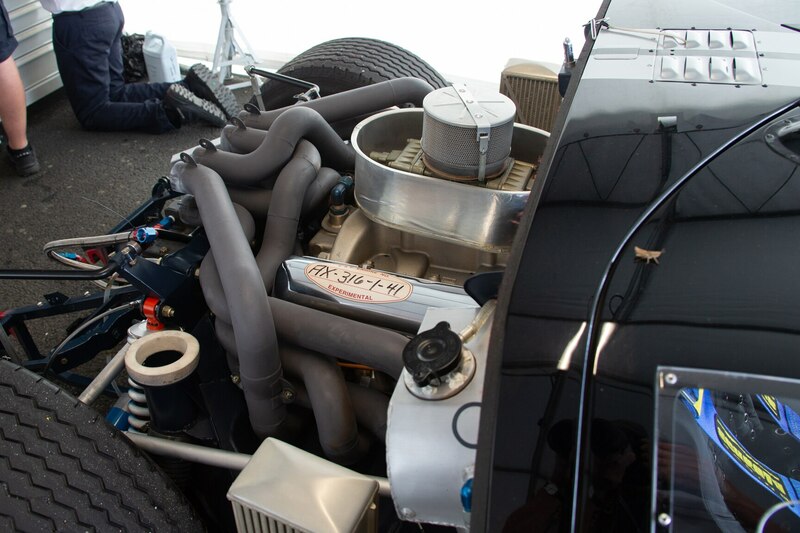 After 1969, all 917s were updated with revised bodywork that made them more stable and ultimately hugely successful. 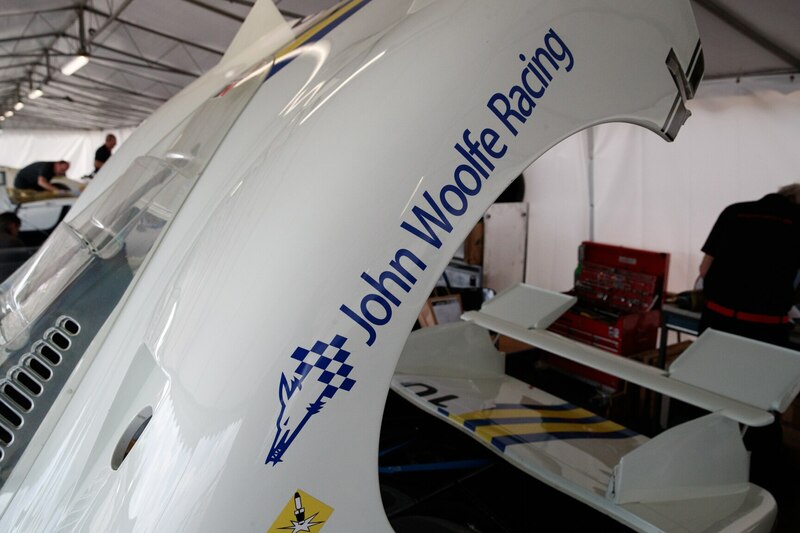 A British enthusiast acquired what was left of and the title to the John Woolfe car and had it rebuilt to its original specification, and the car was entered at the Le Mans Classic almost 50 years after that tragic day. Unfortunately, it was crashed once more. 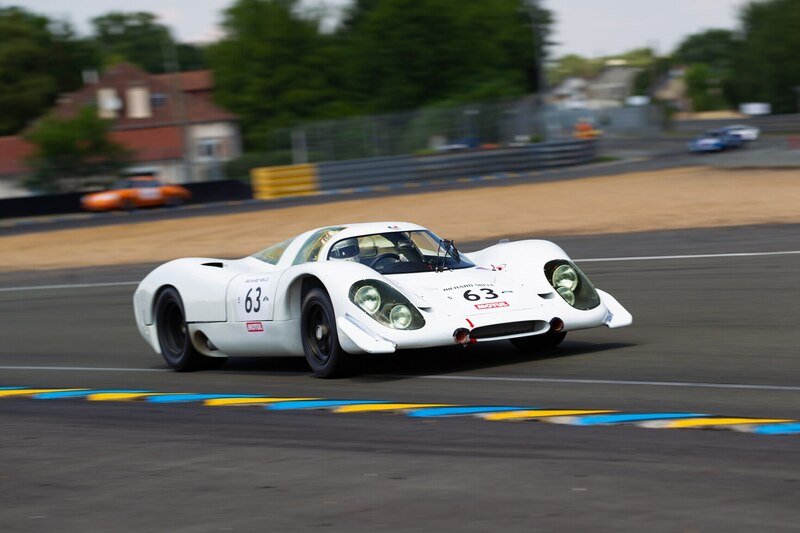 There was a second 1969-specification 917 entered as well (it was prepared by Freisinger), and Porsche factory driver Dumas reported many of the same drivability issues as his predecessors did back in ’69.